William Buck's Brendan Copeland (M) leaving the NSW Supreme Court yesterday. William Buck director Robert Whitton. William Buck’s Brendan Copeland and Rob Whitton continue to resist attempts to replace them as liquidators of Ridley Capital Holdings (RCH), a company associated with architect Joshua Ridley that these days goes by the nom de plume ACN 151 726 224 Pty Ltd (in Liq). In the NSW Supreme Court yesterday barrister Jim Johnson acting for the plaintiff and RCH’s former business partner Corbis Global, told Justice Ashley Black that while his client alleges no impropriety on behalf of the liquidators, it wants to install John Sheahan and Ian Locke in their place. 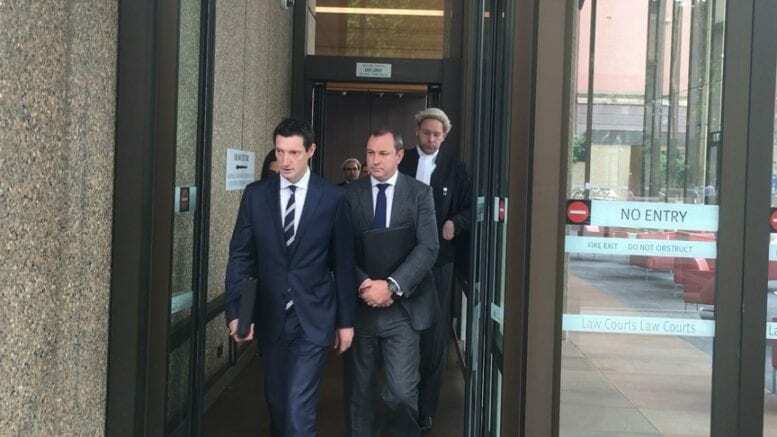 Copeland and Whitton are accused by Globis of not investigating sufficiently the circumstances preceding RCH’s liquidation.The court heard that they had formed the view that there had been no phoenix activity. It also heard the liquidators declined to conduct a two day public examination of Joshua Ridley last May though Corbis was open to providing some funding. Sydney Insolvency News makes no allegation of wrongdoing against the liquidators or Joshua Ridley. Lack of funds was blamed. While Copeland and Whitton received $11,000 from Josh Ridley at the time of their appointment in November 2015, their counsel Daniel Neggo said yesterday that the administration is so impoverished it could not cover the court filing fee required for the hearing. This may or may not explain why neither Copland or Whitton put on an affidavit in their defence. Copeland declined to comment when approached outside court. At the time of the liquidators’ appointment Corbis was suing RCH for more than half a million dollars in outstanding fees. Ridley had initially filed a cross claim for $3 million in damages for injurious falsehoods he alleged were distributed to RCH clients in emails sent by Corbis’s Argentinean founder and chief executive officer, Martin Amengual in 2012. Ridely however abandoned both the cross claim and the defence of Corbis claim for unpaid fees in late 2015. Three days after Copeland and Whitton were appointed the Supreme Court found in favour of Corbis to the tune of $660,826.52 plus legal fees, which Corbis claims are in the order of $500,000. Yesterday’s hearing was adjourned until November 11. In the interim documents produced in answer to a subpoena in separate but related proceedings by Ridley client and global design practice Hassell are to be brought into the so-called “liquidation proceedings” on a limited basis. It’s expected that once formally filed and served Corbis will attempt to widen the scope in which the documents can be utilised when the hearing resumes. It may very well turn out that Copeland and/or Whitton file affidavits in their defence. Though there is of course the question of where they will find the funds. 1 Comment on "William Buck pair not budging on Ridley"
Joshue Ian Ridley ? Former CEO of Ridwest?